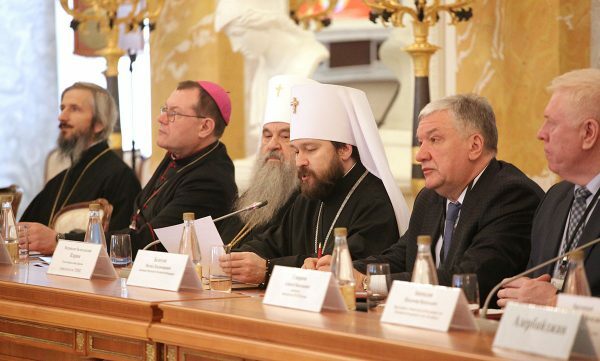 On April 26, 2017, the Christian Inter-confessional Consultative Committee (CICC) has opened its 5thplenary session at the Constantin Palace in St. Petersburg under the theme ‘Faith and the Overcoming of Civil Confrontation: Lessons of the Century’. The meeting is attended by representatives of Orthodox, Catholic and Protestant Christian communities in Armenia, Azerbaijan, Belarus, Estonia, Georgia, Kazakhstan, Kirgizia, Latvia, Lithuania, Moldova, Russia, Tadzhikistan, Turkmenistan, Ukraine, and Uzbekistan. Acting as moderators are the CICC cochairmen, Metropolitan Hilarion of Volokolamsk, head of the Moscow Patriarchate department for external church relations; Archbishop Paolo Pezzi, ordinary of the Catholic Archdiocese of the Mother of God in Moscow, and Archbishop Dietrich Brauer of the Evangelical Lutheran Church of Russia. A message of greetings was received from President Vladimir Putin. It was read out by Mr. M. Belousov, deputy head of the Russian State Administration for Domestic Policy. Metropolitan Hilarion brought a message of greetings from His Holiness Patriarch Kirill of Moscow and All Russia. The gathering was greeted by Metropolitan Varsonofy of St. Petersburg and Ladoga. Metropolitan Hilarion made introductory remarks saying that the events of 100 years ago are taken by society very keenly, and the participants in the plenary session met to reflect on their spiritual causes so that, through their analysis, it can be possible to avoid in the future the repletion of old mistakes which may lead to new divisions. After the introduction, Metropolitan Hilarion made a report. Noting that the CICC 5th plenary session took place in the year of the centenary of the two Russian revolutions followed by a civil war, ‘red terror’, mass repressions, he stressed that ‘these tragic events radically changed the fate of our peoples and told upon the course of history of the entire humanity. Their consequences have been since reflected on the political picture of the world and interwoven in the fabric of global processes taking place on the planet’. ‘Many people became blinded spiritually and it was manifested in both revolutionary events and the internecine slaughter of the civil war’, His Eminence reminded the gathering, ‘Each one defended one’s own truth and was ready to kill and torture one’s brother for its sake. This phenomenon had not economic, nor political, nor social grounds, but rather ones lying in the spiritual plane. Something happened to the souls of a considerable part of the people that stifled in it the voice of conscience, reason, compassion’. He also spoke on the causes and consequences of the severe persecution descended on the faithful as a result of the revolution and on the revival of the Church in our time. ‘No human truth can be put above the divine truth. As His Holiness Kirill tirelessly keeps reminding us, freedom is always goes together with responsibility. The desire to understand and forgive one’s neighbour should prevail over the passion to assert one’s superiority. No violence can eradicate the faith in God, while the power which decided to build society without God will certainly fall, for a house built on sand cannot stand ground (Mt. 7:26-27). ‘Today our peoples live in different states and build their future on their own in cooperation with each other and with the whole world. God grant that their development may also be based on moral values, love of God and the neighbour, on the desire to build their happiness through their own efforts and to reject every enmity. Then we will not have to learn again the lessons we were taught in the recent past’, the DECR chairman concluded. Among the speakers were Archbishop Paolo Pezzi and Bishop Einars Alpe of the Lutheran Diocese of Daugavpils. In the course of the meeting, Metropolitan Hilarion presented Mr. I. Sudosa, head of the DECR St. Petersburg branch, with the DECR Medal of St. Mark of Ephesus, pointing to the long-standing contribution he made to the development of external church work and inter-confessional cooperation. After a break, the discussion continued in four round tables. ‘The fact that we have gathered together here bears witness, in the first place, to our unity. We have come from different countries but we hold one faith in Christ. We belong to different Christian confessions. We all believe in Jesus Christ as God and Saviour, we believe in the Holy Trinity, we believe that it is in Christianity that the future of our homelands lies because we represent here different countries. I believe it is the most important thing. The lessons on which we reflect today, including those of the revolution that happened one hundred years ago, show that any society which is not built on a religious foundation is doomed to grave trials, as was the case after the 1917 Revolution when the authorities declared a policy of struggle with the Church. It resulted in innumerable disasters for both the Church and the people’. Metropolitan Hilarion also said that the participants in the meeting wished once again remind our peoples that without God it is impossible to build a society with justice. ‘For our people for many centuries, the Christian faith defined our consciousness and stimulated the development of culture and was what morality is based on. And this morality was the foundation for building the life of our peoples. When a part of our people followed those who declared struggle with religion, who openly stood against God, it became the cause of our greatest national tragedy, the consequences of which we can still feel. Therefore, we believe that our future is in the faith in God, in the faith in Christ as God and Saviour’.